The World Zen Fellowship, Potomac Zen Sangha, Baltimore Zen Center, Colorado Zen Center and Patriarchal Zen Society are open to everyone. We are a non-profit organization supported entirely by donations. Our purpose is to awaken each and everyone's higher nature and to share compassion with the community. Please help us offer a refuge for meditation and teaching. Your donations go towards maintaining the Sangha and offering services to the community. Buddha got enlightenment upon seeing the morning star. 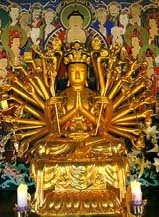 The symbol of Buddha's enlightenment, which is your original mind. The Bodhisattva of Great Compassion. A former incarnation of the Buddha. Make your checks payable to the World Zen Fellowship OR email your name, address and donation amount to potomaczen@yahoo.com, and we will send you an invoice. There is no minimum and all donations are appreciated. We understand that not everyone is able to help out with the full membership amount. Other ways to contribute include volunteering and, most importantly, sincere practicing.